Coach. We ran this play twice today The first time gaining 30 yds and the 2nd for 50 yds and a TD! Thanks for showing how this play works! Congrats, I am glad it works for you. I love the play. Love it! The very first time our team ran this play it went 80 yds. for a TD. The kids love the play and want me to call ” The Beast” every down. Awesome, yes, beware of the Beast. Great play and I am very happy you are successful running the Beast. We just went over the Beast tonight at practice. This is a great play. I never ran it but I had to play a team in the county championship and this play was the only reason they were in the championship. We beat them but they scored 3 touchdowns on us with this play. We hadn’t given up but 2 touchdowns all year. Playmaker Football! I was a teenager on my friend’s Mac playing that game all night! Love the idea of this play at the youth level. I’m a defensive coordinator and best case scenario, I call a time out to have a chance to scheme against it. Worst case, they score 6 almost automatically if blocked correctly. At first I was very skeptical, but this formation was literally the difference maker for us. In our 8 and 9 year-old division, we entered our year-end tournament as the second best team, having lost to the number one seeded team twice in the season by a wide margin. They were simply a more physical, faster team. We needed an offensive scheme that was 1) quick hitting (even our T-formation plays were taking too long to develop, shutting them down with their better, faster players) and 2) easy to learn in a short timeframe. The beast was perfect. In the championship game, we averaged 4 yards per play and held the ball for almost an entire quarter. Our QB was able to hit the early hole often and the occasional outside run for yardage. When the defense adjusted to match up our overload, we ran successful counters with the FB in the opposite direction, which forced them readjust to a more balanced look and gave us an advantage on the overloaded side. After running the ball exclusively for 3 quarters, we had our TB run a streak while the QB opened normally by taking two steps play-side and then dropped back for a pass. Wide open – game-winning TD. Thanks again. This formation with its simple blocking scheme is a great youth football offering. we use this play every year and works great every time, only difference is we move one guy out to split receiver and have him go in motion and crack the end and the other backs go right around him. If there is a really good backside DE then you may get caught by him sometimes. We run this all the time and the backside DE usually is not an issue. Especially if you have your EMOL on the backside GOO (GAP on Outside) block. The EMOL might be able to hit him just enough. Plus the play is more like a wedge so if the RB is hesitant or goes too deep then there is an issue. Your RB really needs to get into the seem then break. The back is not really reading anything, he is pounding the ball. If you want a fun trick play off this formation for the defensive end who likes to chase, let me know. We ran Gap Smash — what you call Beast — formation a few years ago with much success. Our play, which was drawn up by our assistant, pretty much scored every single time. We just called it Trick Play. Installed rhe beast after week 1..about a month ago.in 6 quarters using It we are up 70-0.. (I say 6 quarters because one team quit at halftime)..not using exclusively but we run it in a no huddle frequently.we are only utilizing four plays..but have scored within the four play rotation every time we’ve called it..my assitants were skeptical when I installed it..some were upset believing that I was adding too much for the kids (10-11 yearolds)..the kids love it..and the coaches are hailing me a genius..I remind them that everything we do I stole from someone else. Why not focus on formations that are actually used in high school and college and then spend time teaching kids technique? I get it…youth teams struggle with the pass, thus the defense loads up the box, and linemen can’t pull yet to give you the extra blocking, so we stock-pile everyone to one side. Makes sense, but it seems like we are scheming for pee wee football wins rather than teaching kids how to play the game. Any thoughts? I know the question was posed months ago, but I’ll answer anyway for anyone reading later. To quote from the article, “The play is all about the blocking.” What is football? Blocking and tackling. By the time the kids are high school age, they’re 1, not playing anymore, 2, playing a different position, 3, prepared to play a physical game by playing ANY youth offense/defense. By the logic of “prepare for real football in high school”, youth programs should be running 4-3 or 4-2-5 defenses. Which is a silly, losing proposition. Youth coaches should coach their team, not prepare their kids to play high school ball. You can easily run counters, a reverse, and pass from this offense. We did. I proposed this offense to our coach for our developmental (minimum play) players. Like some other responses, our kids LOVED the Beast and always wanted to run it. Our starters that ran the spread loved seeing it. Our goal was a first down in 4 plays. You don’t need studs. Our kids who ordinarily got stuck getting buried on the interior D line for 5 plays, or worse, were decoy WR that basically didn’t even “play”, got to experience success. Have fun. Worry about high school when they’re in the last year of middle school, and only then. We run a similar version to this, but add the RG pulling, nobody can defend it. This is a good play as long as the other team is coaching for just youth football. We have several teams that run simular overload offensive and all I do is convert my 425 into a 4:3 stack drop my safety as a force and play man.. Shut it down immediately! or they go for 2 and three yard gains…. what I don’t like about this play is that the rest of the team doesn’t really learn anything coaches use this play as a crutch to win and when the other kids get to the other level they don’t know anything about blocking gaps, hitting specific whole numbers, running routes etc. Guys we’re coaching for a reason to teach and if you only have four guys on the team who are experiencing glory and the rest are just warm bodies to block that’s not coaching and you’re doing your team a great injustice. Coach, you are assuming a lot about me and my offense. I doubt you read my blog in detail. Over the last 10 seasons or so, I run a multi formation offense with about 4 formations and about 50 base plays, so about 100 plays right left in total. Much more advanced and better plays than my local middle school or high school. Many of my former players say my teams are better coached than their middle schools. We teach a ton to technique and football IQ info. I run a Power I, Beast / Single Sing, Double Wing and a Jet Spread formation called the Spin from an article in American Football Monthly in 2006. I uses wrist coaches and a no huddle nick name play calling schemes to call plays from the sidelines. If you have read the blog you see I teach a hole numbering position naming system using t-shirts that I developed for 2nd graders many years ago and my backs are numbered 1-4. I use 8 different blocking calls depending on the defensive sets and adjust blocking as needed with line calls from my Centers. I appreciate your comments but this play is all about blocking at the point of attack. This is more than a four player play. This is about 10 players doing their job blocking so the running back and run into the end zone. I actually would love to see a college team pull this out after running 4 spread plays in a row and watch the defensive coordinator freak out and calla time out to adjust. Many coaches really do not understand the play or football, so yes I am sure you can shut it down. I’d like for you to shut down my Beast Tank play out of a 4-3 stack. I can shut most plays down if I have time to shift into a defense for that play. We run the play within our normal offense so defenses have a hard time knowing when we pull it out. Yes, some of my opponents know how to shut it down and that’s when we run another play or the wedge or counter from the same formation from an audible call or the backside jump pass. But I am sure you know we can do that already and will be prepared for that too. So, please do not assume I use this play as a crutch. I use this play to ram my team’s will down your team’s throat. While your working on the Spread with a QB who will probably never play QB in HS or College, your Center is snapping the ball over your QBs head, and your receivers are dropping every ball and your line does not know how to Zone block because its really too difficult for most youth football players, and the your backs do not know how to read the Zone holes and cut backs lanes, my Beast offensive line and running backs will be running for 3 to 5 yards a carry eating up the clock and scoring on 12 and 14 play drives while you wrestle with how tired your defense has become. And in the 4th quarter please get ready for more. I think maybe you need to study the game some more. 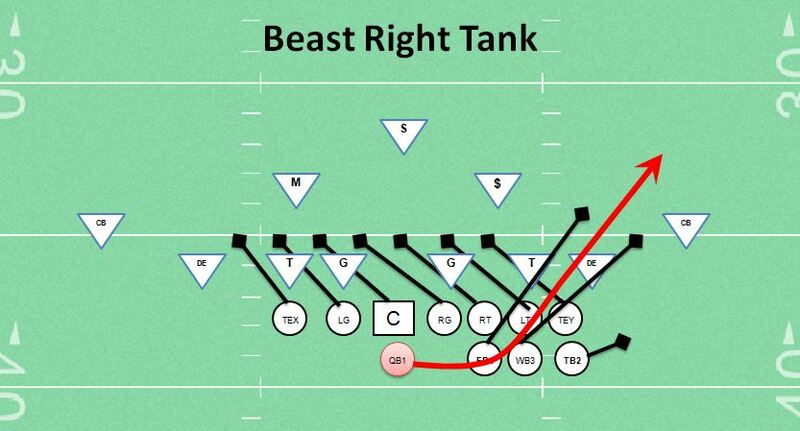 The Beast is a Single Wing play from Yale in the early 1920’s. It is football when football was real football. Again, I appreciate the feedback but you know what they say about assumers…..
You are the man!!!! We run SW and BEAST and hear the same thing from critics and doubters. Most like to think they are good coaches because they are running similar PLAYS as seen on Sunday. My response to them is you must really like losing. Keep up the good work! I have used the Beast for 9U team for 7 seasons with the last 2 of those as our main offense….16-2 record and league runner in those seasons. The Beast is well…A BEAST.